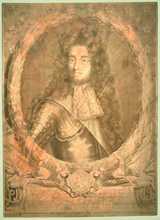 This copper plate shows William, 3rd Duke of Hamilton, the husband of Anne, 3rd Duchess of Hamilton in her own right. It was made in London soon after his death in 1694 so that memorial engravings of him could be produced. It has been in the Hamilton Collection ever since. The image on the copper plate is reversed, so that when it was inked and prints were made from it, the portrait came out the right way round. The plate had included an error in the duke�s coat of arms, but it was corrected when the duchess sent it back to London in 1706 for engravings to be made. The son of William Douglas, 1st Marquis of Douglas, the 3rd Duke of Hamilton fought in the royalist army in the mid-1650s and, in 1656 married Anne, 3rd Duchess of Hamilton in her own right. At her request, Charles II made him Duke of Hamilton. In parliament, the duke led the opposition to John, 1st Duke of Lauderdale, later serving twice as Lord High Commissioner. President of the Scottish Privy Council in the 1680s, he occupied other important offices including that of Lord High Admiral and was an extraordinary Lord of Session.